If you have applied password to PST file to protect it from unintended access but unfortunately you are not able to remember it now then the contents of PST will not be fetched. Microsoft Outlook don’t provide any help in retrieving a lost PST password, in such situation you can download free tool called pst19upg.exe from Here and remove password from encrypted outlook PST file. Microsoft released pst19upg.exe freeware to upgrade PST files to work on later versions but it can also be used to remove password from the PST file. However, pst19upg.exe utility can work only on PST files created with Outlook 2002 or older versions (ANSI PST) of Outlook. Latest version of Outlook 2007 and above have UNICODE PST file, to remove password from these files you can upgrade to Outlook Password Recovery Software. 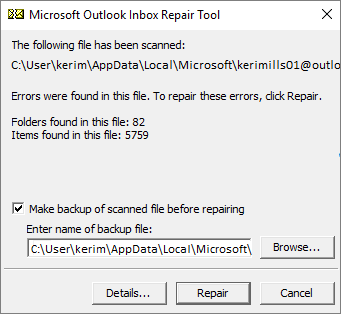 First you need to Close the Outlook. This will create a copy of the pst called “filename.psx” (where filename is the same name as the original pst file). At the command prompt, type exe -i filename.psx and hit enter. Remember, you need to use the full path to pst19upg. This process will create a password-free pst file from the psx file. The PST file will get repaired and will be error-free.